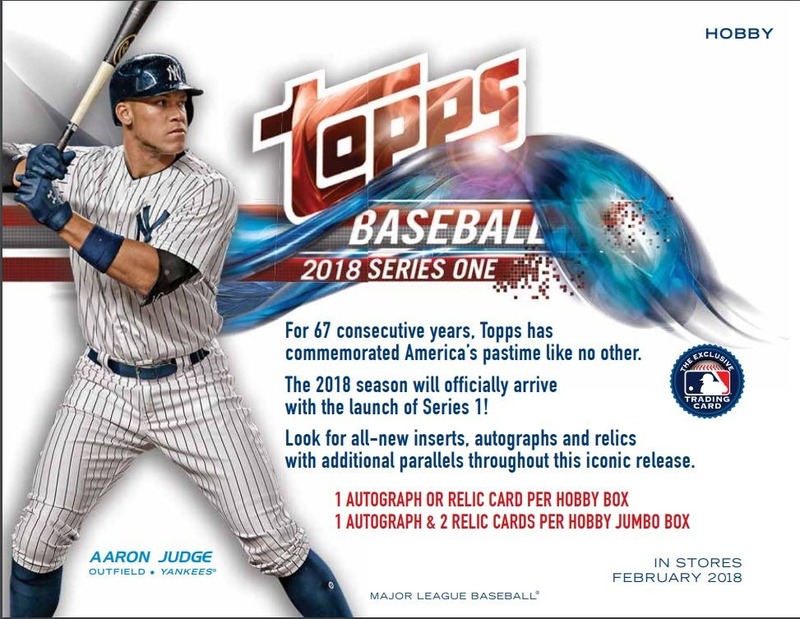 For 67 consecutive years, Topps has commemorated America's pastime like no other. The 2018 season will officially arrive with the launch of Series 1! 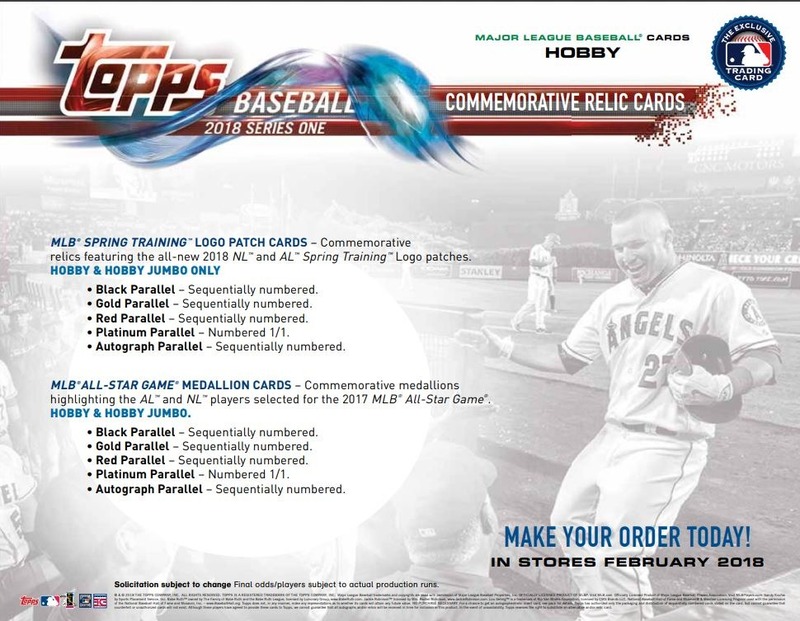 Featuring Veterans, Rookies, Future Stars, Team Cards, League Leaders, World Series Highlights and Combo Cards. - Rainbow Foil Parallel - Inserted 1:10 packs. - Gold Parallel - Sequentially numbered to 2018. - Vintage Stock Parallel - Sequentially numbered to 99. - Independence Day Parallel - Sequentially numbered to 76. - Mother's Day Pink Parallel - Sequentially numbered to 50. 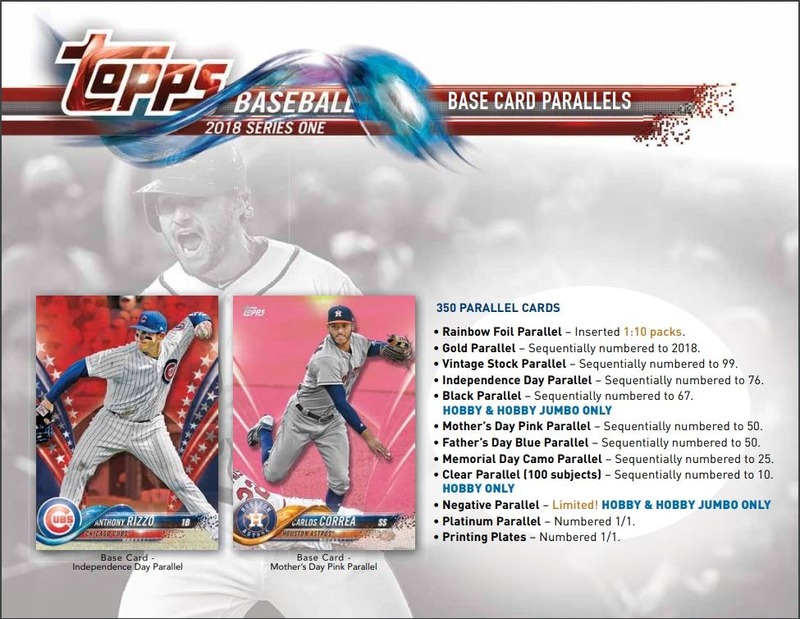 - Father's Day Blue Parallel - Sequentially numbered to 50. 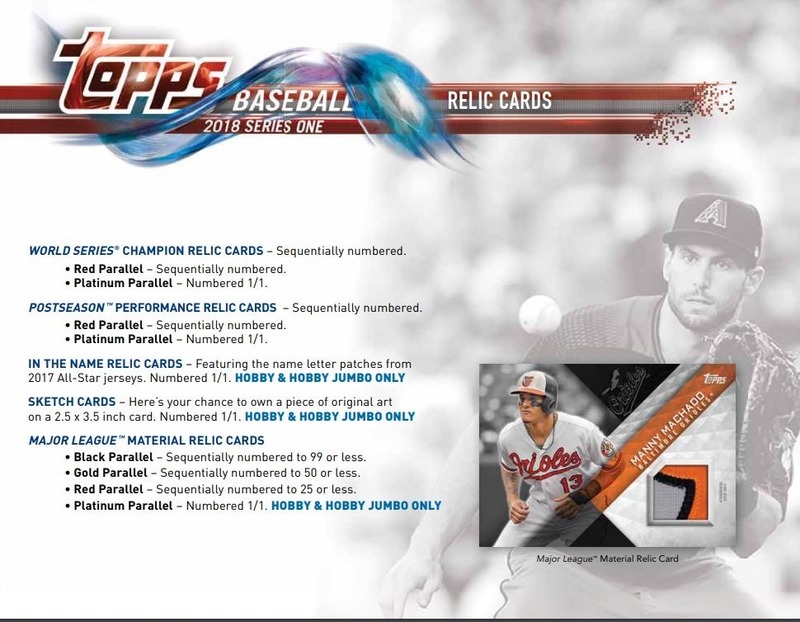 - Memorial Day Camo Parallel - Sequentially numbered to 25. - Platinum Parallel - Numbered 1/1. - Printing Plates - Numbered 1/1. 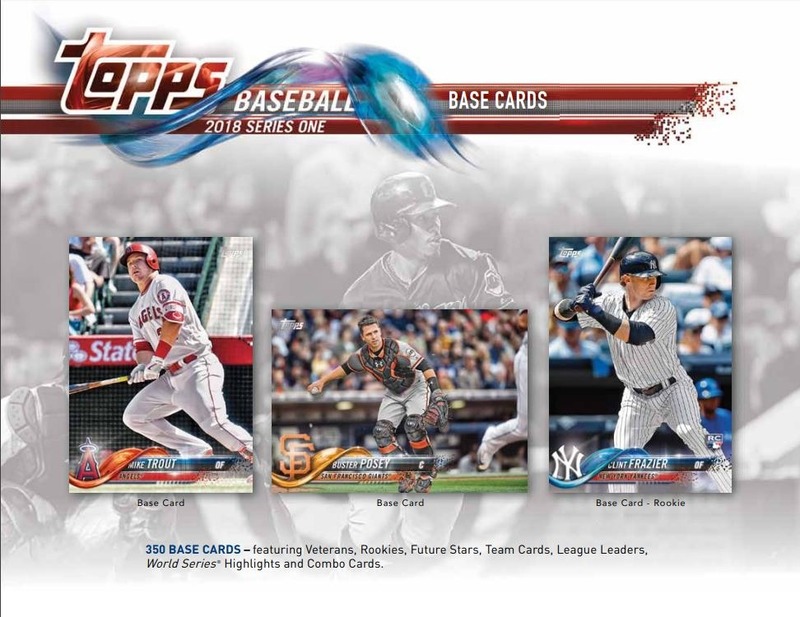 With an all-new look, these cards pay tribute to key celebratory days during the baseball season such as Mother's Day, Father's Day, Memorial Day and Jackie Robinson Day. Also included are the top Rookies and the game's legends. Inserted 1:8 packs. - Black Parallel - Sequentially numbered to 299. - Gold Parallel - Sequentially numbered to 50. - Red Parallel - Sequentially numbered to 10. These artist-inspired cards capture the brightest players in the game. Inserted 1:8 packs. Pays homage to the various 2017 award winners including MVPs, Cy Young Award Winners, ROYs, Silver Sluggers and best fielders. Inserted 1:8 packs. 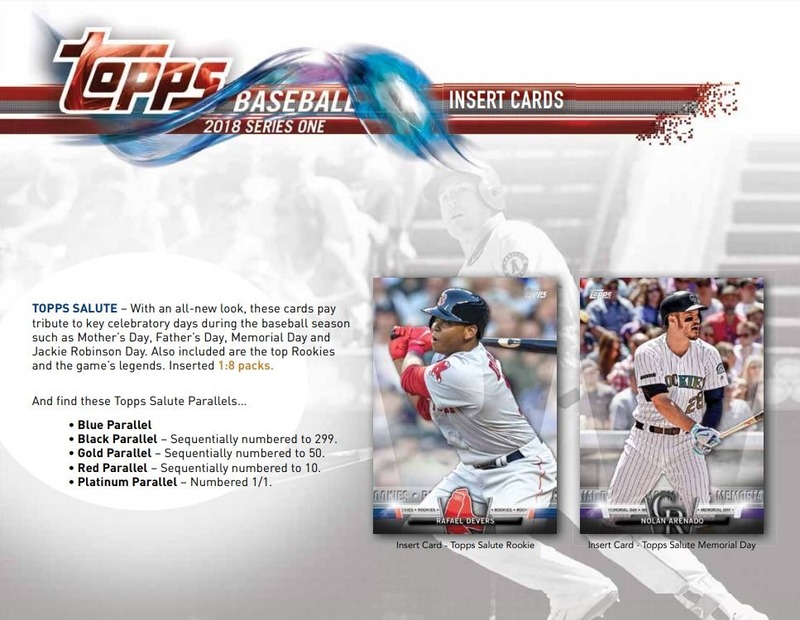 Topps celebrates the 35th Anniversary of this iconic design that featured the rookie cards of Hall of Famers Tony Gwynn, Wade Boggs and Ryne Sandberg. Inserted 1:4 packs. - Gold Parallel - Sequentially numbered to 5. - Red Parallel - Sequentially numbered to 25 or less. 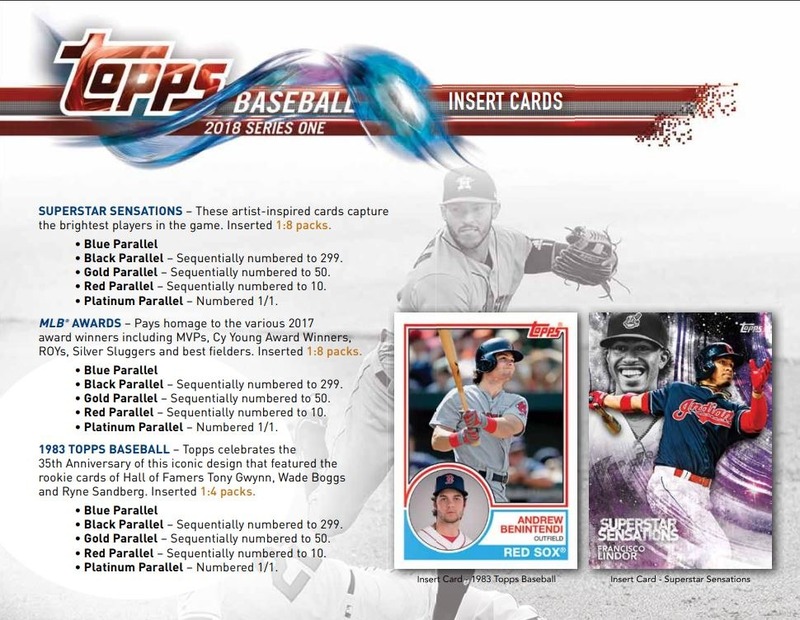 MLB AWARDS AUTOGRAPH PARALLEL CARDS - Sequentially numbered. 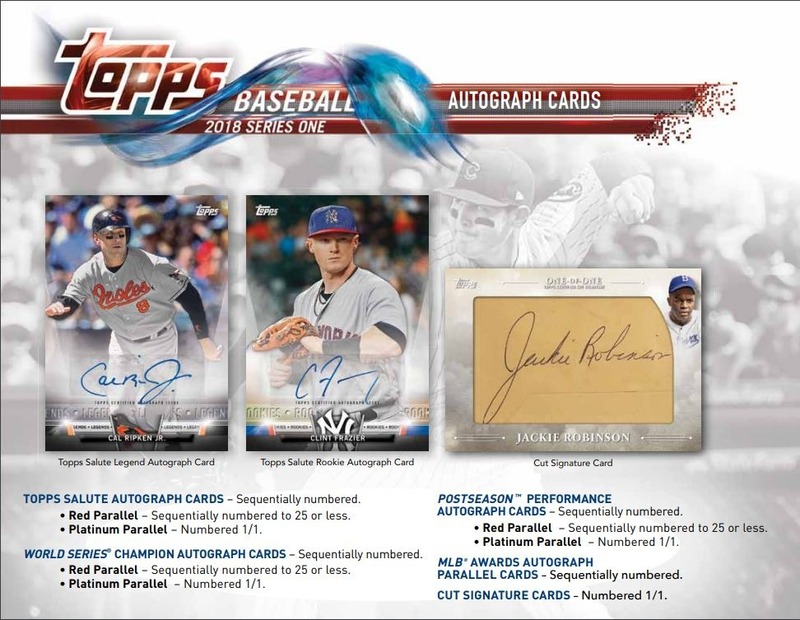 CUT SIGNATURE CARDS - Numbered 1/1. Including autographs from the biggest stars in the game. - Black Parallel - Sequentially numbered to 99 or less. - Gold Parallel - Sequentially numbered to 50 or less. - Red Parallel - Sequentially numbered. - Black Parallel - Sequentially numbered. - Gold Parallel - Sequentially numbered. 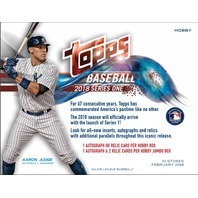 - Autograph Parallel - Sequentially numbered. Commemorative medallions highlighting the AL and NL players selected for the 2017 MLB All-Star Game. HOBBY & HOBBY JUMBO.